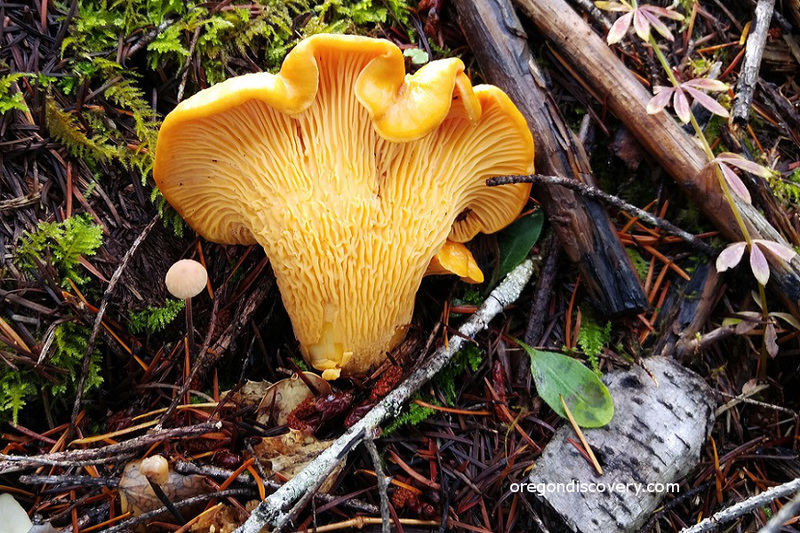 In 1999, the Oregon Legislature declared the Pacific golden chanterelle as the official mushroom of the state of Oregon. This mushroom is unique to the Pacific Northwest and distinguished from the golden chanterelle (Cantharellus cibarius) species. The Pacific golden chanterelle (Cantharellus formosus) build the mycorrhizal or symbiotic association with the roots of conifer trees such as Douglas-fir and western hemlock. The mushrooms are generally more abundant in the second-growth forests from British Columbia to California. The Pacific golden chanterelle is easily identifiable and perfect for novices who eager to harvest delicious wild mushrooms. Having potent insecticidal properties and generally free of bugs, these fungi have high nutritional and culinary values. Cautions: Chanterelles like many other mycorrhizal fungi accumulate toxic heavy metals such as lead and neodymium. Avoid the polluted areas near metal mines, industrial buildings, or busy highways. Where and When to Find Pacific Golden Chanterelles? The Pacific golden chanterelles are mostly found in high-elevation forests (above 1,500 feet) of the Coast Range and the Cascade Mountains along the north-facing hillsides and slopes. Places to check. Chanterelles are found near coniferous trees such as Douglas fir and hemlock, oaks, in the shaded areas among ferns, vine maples, and Oregon Grapes. Places to avoid. Chanterelles do not grow under the direct sunshine, on lawns with no tree, and under fruit trees and among clover plants. These fungi grow on the ground, often hidden under patches of moss. Warm soil and heavy rainfall create right conditions for Pacific golden chanterelles fruiting. 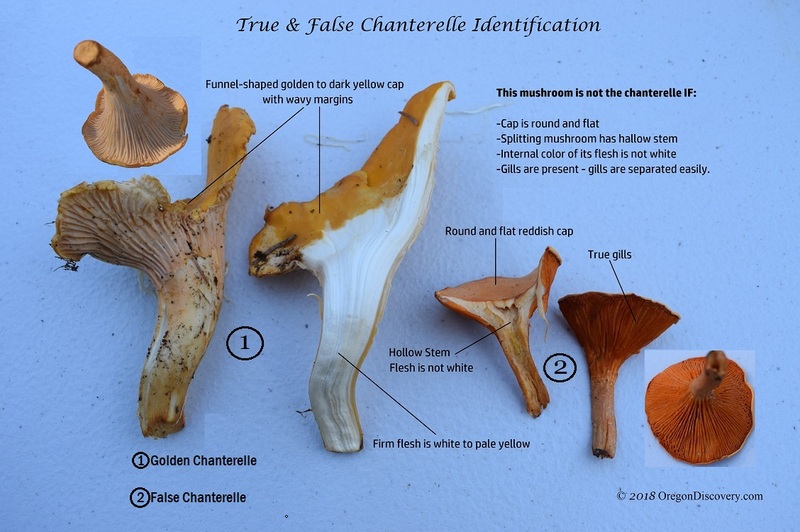 If you spot a chanterelle, carefully check the area surrounding the tree nearby. These species tend to establish permanent colonies, growing in groups. If you have your secret chanterelles' spot, you will return again and again and harvest the wonderful yellow mushrooms. If you never before collected chanterelles in the wild, start from any forest service road. Apply all of the tips mentioned above to find chanterelle. Do not get lost! The western and eastern slopes of the Cascade Mountains: Mt. Hood National Forest, Willamette National Forest, Deschutes National Forest, Umpqua National Forest are the best. The Coast Range: Tillamook State Forest, Siuslaw National Forest, Rogue-Siskiyou National Forest. The chanterelle season in the Pacific Northwest begins as early as mid-summer at the higher elevation and lasts to the first frost, typically, until November. However, every year is different. The chanterelles growth is triggered by rainfall and continuing warm and humid weather. If first fall rains begin earlier, in August, you will get golden forest treasure at the end of August 7-10 days after the good rainfalls. Cap: Funnel-shaped, center sunken, wavy margins, not round, golden to dark yellow, 1-6 inches (2-15 cm) wide. Cap's Underside: Wrinkles, ridges with interlacing veins, going down the steam, whitish to yellow. Spore Print: Elliptical, whitish to pale yellow. Steam: Whitish to yellow. Descending long stalk, 2-5 inches (4-12 cm) long. Flesh: Firm and solid, white to pale yellow. Fruiting: Singly or in groups. Habitat: Mycorrhizal with conifer trees: Douglas firs, western hemlock, and Sitka spruce. Most likely found in the second-growth forest. Season: Mid-summer to late fall. Chanterelle is an excellent source of dietary fiber, protein including 8 essential amino acids, potassium, copper, manganese, iron, Vitamins D, C, B, and A. The presence of these compounds ensures health advantages of chanterelle; these mushrooms possess immunomodulatory, anti-inflammatory, antioxidant, antiviral, anti-cancer, antimicrobial and antigenotoxic properties. An hour or more exposure to sunlight may increase vitamin D amount in the mushrooms. Any edible wild mushrooms, including chanterelle, should not be eaten raw. Their cell walls are hard to digest and could cause an upset stomach. Any type of cooking helps break down cell walls, making them easier to digest. These fungi have an excellent nutty flavor and sweet aroma of apricots. The golden-yellow color of the chanterelle is retained after cooking, which makes dishes beautiful and delicious. Methods of cooking include stir-frying, sautéing, drying, pickling, preserving, or freezing. Clean mushrooms gently with a brush, they should not be washed unless they are very dirty. If they must be washed, fill a container with water, rinse mushrooms quickly, so they do not absorb too much water. Add 3 tablespoons of sour cream, mixed and stew for 5-7 minutes. Serve over rice, pasta or potatoes with freshly grated parmesan.